The 71 NYhavn is located near other hotels in Copenhagen as well as a variety of attractions, including the harbor, Amalienborg Castle, Royal Palace, Royal Theatre and the Stroget shopping district. There are many restaurants, bars, cafes and coffee shops located in the vicinity of the hotel. Entertainment venues can be found in the local area as well. 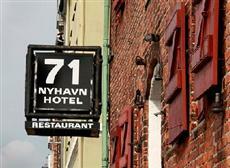 The Hotel 71 NYhavn offers a car rental service for the convenience of guests who would like to independently explore the city during their stay. The airport is located only a short drive from the hotel. Public transportation services, including metro and bus services, are available in the area. The 150 well appointed guestrooms at the 71 NYhavn Copenhagen feature cable television, trouser press, hair dryer, ironing sets, mini-bars and high speed Internet connections. On-site amenities offered at the 71 NYhavn Hotel Copenhagen include a restaurant, meeting facilities, lounge bar and Internet access. The hotel also offers a business center for the convenience of business guests during their stay at the hotel.